After seeing this cake here yesterday on the Novice Chef, I really wanted to make this cake. 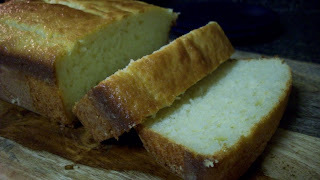 The recipe is originally from Ina Garden and like most of her recipes it doesnt disappoint. I love lemon in pretty much anything, it just gives such a light, fresh flavor. I only had fat-free vanilla yogurt at home instead of whole plain yogurt so I used that. I also used canola oil instead of vegetable oil and made a rasberry sauce instead of the glaze. Here's the recipe as I made it. Preheat oven to 350 degrees and grease and flour an 8"x4"x2" loaf pan. Sift together flour, baking powder and salt. In a separate bowl, mix together eggs, sugar, yogurt, vanilla and lemon zest and juice, being careful to keep any lemon seeds out of the batter. Mix in dry ingredients. When combined, gently fold in vegetable oil. 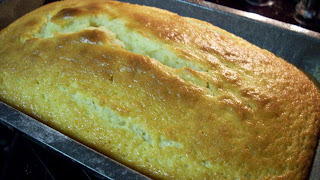 Pour batter into prepared pan and bake for about 50 minutes until a toothpick inserted in the center comes out clean. Cool on a wire rack about 15 minutes are then remove from pan. 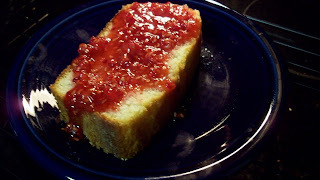 Slice and top with raspberry sauce. Heat all ingredients in a saucepan over medium heat. Use a wooden spoon to crush raspberries. As the sauce heats the berries will easily break down. 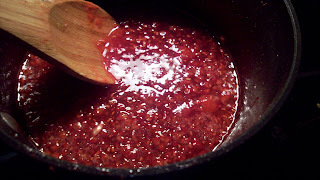 Cook until berries sauce is a uniform consistency and remove from heat. Sauce will thicken slightly as it cools.